Mary Beard is a famous Cambridge classicist (if such a thing exists). She’s hosted television shows and written books and published papers and taught many students about the ancient world. 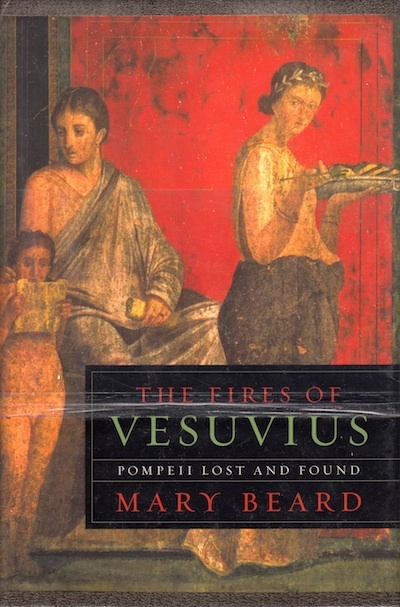 The Fires of Vesuvius is her studying the Pompeiian ruins and sharing what we can learn about ancient Roman society from them. So what did I learn? Phalluses were everywhere; people ate fancy dinners reclining on couches arranged in a group of three in a c-shape; people ate regular dinners on chairs and tables; women were second class citizens (sigh); and no one knows where ancient Romans slept. Seriously – beds weren’t a thing, so…. did they sleep on the couches? On the ground? No one knows. Well, *I’m* clearly fascinated by ancient Rome. I love learning about it and I love the stories. Modern society has a stereotype of the ancient world being very serious and no color at all. In fact, there’s color everywhere in the Pompeiian ruins, and the graffiti makes it clear that these were people just like we are. There are political slogans and advertising on the walls; there’s evidence of a child’s lessons on the walls; even some random doodling. It was, apparently, very stinky. The Pompeiians didn’t brush their teeth, and there’s no evidence of soap at the baths. No wonder perfumes were used. The Fires of Vesuvius makes my views of the ancient Roman world richer – it’s not just Julius Caesar and Nero fiddling while Rome burns. It’s real people living their lives, making money, having babies, worshipping gods. I quite enjoyed it.